The best shawarma in town. 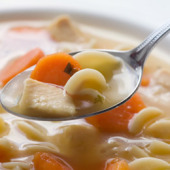 White meat chicken breast, Fresh vegetables “carrots, onions, celery” simmered in a delicately seasoned chicken broth with traditional egg noodles. © 2018 Copyright OnZrocks. All Rights reserved.